This past week, I was having a major craving for scones. I don't know why; I hadn't seen a recipe online or on TV anywhere, but I just couldn't shake the need for triangular wedges of doughy goodness. 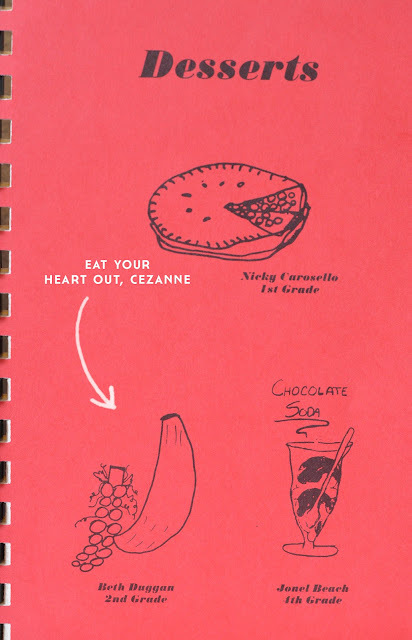 And the more I thought about it, the more excited I got, because, surely, with all the vintage cookbooks I have, there had to be a scone recipe in there that was interesting. I ended up finding only two recipes, and both were the tasteless kind that's rely on gobs of butter or honey on top to bring in some flavor. Well, I only have one word for that: boring. Still determined, I went to the next line of defense: compilation cookbooks. You know, the kind that are printed by churches and schools to raise money for their respective. And I just so happened to have a blast from the past on my bookshelf: the Edgar Road Elementary School "Family Favorites" book from 1991, when I was a wee little second grader. I remember the school having a contest of sorts as they planned the book, asking all the students to submit a drawing that could be used on one of the intro pages when it was time to go to a different group of recipes. And guess whose drawing made it in there? I know...you've never seen such a realistic drawing of a bunch of grapes and a banana (or a bunch of grapes with two perfectly parallel rows...). But back to the task at hand. In the breads section, I came across a recipe for cinnamon honey scones, and decided that's the recipe I would try, because surely the addition of those key ingredients would elevate this recipe a bit. But boy was I wrong. I couldn't really even taste the honey, and barely got the flavor of cinnamon when I bit into it. Stink. So before the scones could cool, I ran to the pantry and grabbed some powdered sugar and a vanilla bean, some salt and some milk. I scraped half a bean into the milk and let it steep about five minutes or so, then added it to the sugar and milk, making a vanilla bean glaze that has saved many a baking hiccup in my past. I poured it over the still-cooling scones, and once it set took another bite. Preheat the oven to 450 degrees and line a cookie sheet with parchment paper. In a large mixing bowl, combine flour, baking powder and cinnamon. Add butter and work in into the flour with your hands (or a pastry blender) until it looks somewhat yellow (or has the consistency of coarse crumbs). Add the honey and milk and break the egg into the bowl. Stir with a wooden spoon until thoroughly mixed (it will take a little time, but keeping working it; I promise it's enough wet ingredients). Take the dough in your hands and loosely pat it into a disc. Place it into the middle of the cookie sheet and start pressing evenly into a larger circle with the palm of your hand until it's about 1/2 inch to 3/4 inch thick. Take a knife and cut into eight wedges. Bake for 15 minutes, or until edges of scones are golden. Once done, remove from oven and let cool 3-4 minutes. Cut vanilla bean in half and scrape the "caviar" out. Mix into the milk and let steep 5 minutes. Add milk-vanilla mixture to powdered sugar and mix, adding more milk as necessary, until you have the right consistency for drizzling. 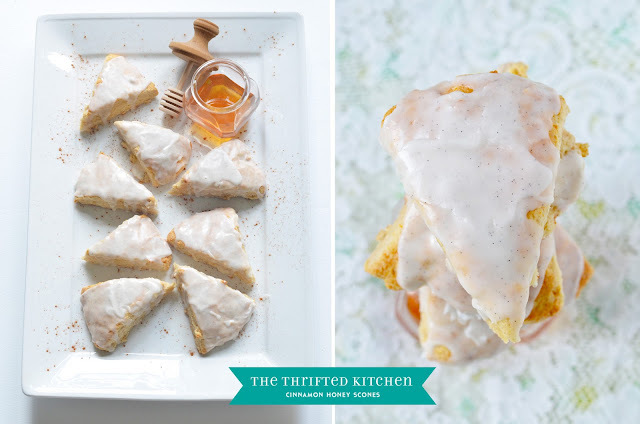 Break apart scones, place on a cooling rack set inside a parchment-lined sheet cake pan. 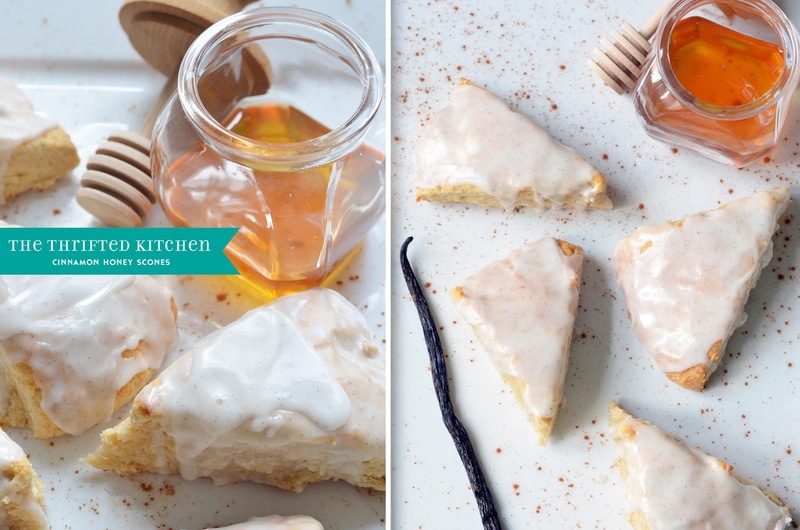 Drizzle glaze over scones and let set 2-3 minutes before serving. maybe more cinnamon. a little extract vanilla, almond? a little lemon zest. blueberries are always good!